Anyone else a little amazed at how fast the months are flying bye? I swear it was just Summer and now we are talking all things pumpkins and there are Christmas decorations in the stores already! What the heck is happening? I'm here just trying to get through life day by day but someone seems to have hit a fast forward button? How do I slow this ride down? Speaking of day by day, at least I am for the most part prepared for today. For the week even. My menu is planned and I just have a few holes to plug in it, but I should be able to do that with out moving things around. Here's what we have lined up for the week. Starting the week out on a lighter note since the rest of the week is a little filling. Switching the tacos up this Taco Tuesday for some steak. I'm probably a little more excited about the Wednesdays dinner than I should be, but I have been wanting it for months and figured Id give in and have a little. Thursdays dinner is a new to me recipe and I'm excited. While I'm not a big spice kinda girl, the guys all love the heat so fingers crossed its a hit! And Friday it will be an all out fend for yourself kinda night. Whatever is left in the fridge is free for the picking. Plus it leaves us with more time to enjoy what is becoming a regular Friday night gathering in the driveway when the sun goes down. Good times! The week before last we threw away more food than I think we have all year. So last week I was very careful to cook less. And we went into this week with a pretty bare fridge. I should have had a fridge stocked with ham, but a certain dog, may or may not have eaten half of it off the counter. But I can't even go there right now. 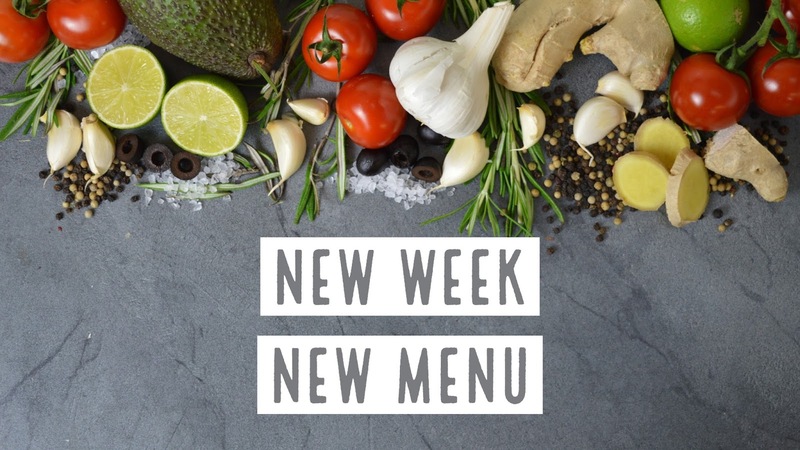 Whats on your menu this week?? How does your house feel about leftovers. A blessing or a curse? Also, I had a few people mention that I haven't shared my cooking dinner on IG in a while, so I will try to remember to do that for at least a night or two. Happy cooking and eating everyone!! I’m always inspired by your cooking and that you are always changing things up in the kitchen—I feel as though I make the same things all the time, and you know what they say. Variety is he spice of life, right?